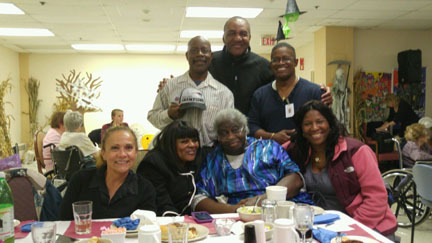 Visitation Ministry at a Healthcare facility. Patient in blue is Mother Dorothy Boyd. On left is Deacon Dave & Mrs. Bruni Gatison. Center is Rev. Al & Mrs. Brenda Smith. On right is Minister Bruce & Mrs. Faye Goldson. 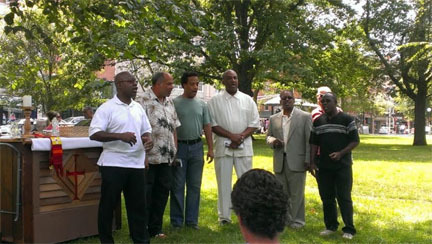 The Men's Chorus Ministering in song and words of encouragement to the homeless in New Haven on the Green. From the left Deacon Dave Gatison, Bro. Rico Jones, Minister of Music Joey Freeman, Rev. Al Smith, Minister Bruce Goldson, Deacon Zeke Collins.